Ahhh, lovely Bullseye purple. This time it's a fab bright sheep with matching purple eyes. Height is 20.99mm. Bead hole is 3/32", does not fit large holed chains. This wonderful alien is black and pink, two-sided and fabulous. Height is 30.08mm. Bead hole is 3/32", does not fit large holed chains. This is a sweet purple frog clinging to a purple bead decorated with white swirls. Height is 19.35mm. Bead hole is 3/32", does not fit large holed chains. Wonderful two-sided silliness! This alien is grey with accents of steel blue and turquoise. Height is 30.59mm. Bead hole is 3/32", does not fit large holed chains. This is a sweet kitty cat in a pale cream color with a bright nose and toes. Height is 22.53mm. Bead hole is 3/32", does not fit large holed chains. A deep green frog is clutching the side of a deep blue whiteheart bead adorned with white flowers. Height is 19.03mm. Bead hole is 3/32", does not fit large holed chains. Pink tutu, blue eyes, adorable. 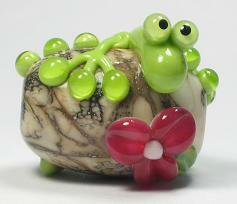 This ia sweet green lizard wrapped around a silvered ivory bead with a fuschia flower atop it. Height is 29.96mm. Bead hole is 3/32", does not fit large holed chains. I really like this little dino - black with a Donna Millard murrini bursting into awesomeness on each side, accented with red spots. Height is 24.03mm. Bead hole is 3/32", does not fit large holed chains. Inque is a fun ivory shragon (sheep & dragon) that tromped through India ink and looks totally delighted with the results. Height is 24.33mm. Bead hole is 3/32", does not fit large holed chains. Etching is a chemical dip that gives a matte finish. It looks darling on this ivory sheep! Height is 21.02mm. Bead hole is 3/32", does not fit large holed chains. This is a chunky, thick base bead of pink with a slight marbling to it, with a slightly spakly green lizard wound around it. I like his toes. Height is 32.14mm. Bead hole is 3/32", does not fit large holed chains. This is a smaller black cat - more a kitten, if you will - with perfect pink toes. Height is 18.3mm. Bead hole is 3/32", does not fit large holed chains. As discussed, a wonderful sky blue and ivory lizard, touched with silver foil. Height is 27.2mm. Bead hole is 3/32", does not fit large holed chains. A delightful, two-sided alien in purple and green. Height is 30.83mm. Bead hole is 3/32", does not fit large holed chains. This is a sweet turtle - green peering out of a spotted sky blue shell. Height is 16.15mm. Bead hole is 3/32", does not fit large holed chains. This is a creamy ivory focal bead with silvered ivory swirled stripes. It's sizeable and very fondleable. Height is 38.22mm. Bead hole is 3/32", does not fit large holed chains. For some reason, a glass manufacturer decided to wrap amber glass around periwinkle. I used it as a base bead, and followed the same theme by winding a periwinkle lizard around it with amber toes and eyes. This is a truly unique bead - I only had one rod of that color! Height is 28.99mm. Bead hole is 3/32", does not fit large holed chains. Sillier and sillier - this is a sweet classic sheep in white and ivory with a single eye. Height is 20.19mm. Bead hole is 3/32", does not fit large holed chains. It's almost Halloween, and the critters are dressing up in costume. This darling sheep found a sheet to hide beneath. Height is 19.1mm. Bead hole is 3/32", does not fit large holed chains. This is my version of a Lite Brite - the classic kid's toy with a black screen and brightly colored pegs. He's two-sided for extra awesomeness. Height is 32.63mm. Bead hole is 3/32", does not fit large holed chains. This is a sweet, charming sheep in all white with teal eyes. Height is 20.18mm. Bead hole is 3/32", does not fit large holed chains. This is a white chubby kitty with Katie Gee's rainbow murrini on her sides. Of course, her paws are adorable - purrfect, if you will. Height is 21.22mm. Bead hole is 3/32", does not fit large holed chains. Catch the rainbow! This bright green lizard did, in spectacular fashion. Height is 32.49mm. Bead hole is 3/32", does not fit large holed chains. I love it when the critters get hobbies. This time it's a pink pig wearing a sweet pair of didy glasses, ready to join me in the studio. 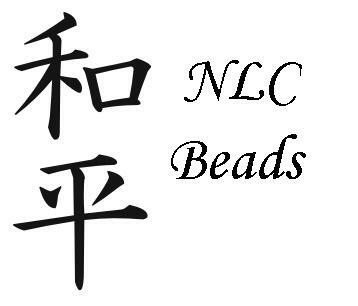 Bead height is 20.08mm. Bead hole is 3/32", does not fit large holed chains. A wonderful ivory and grey lizard, reserved for Tina. Bead height is 28.88mm. Bead hole is 3/32", does not fit large holed chains. Lori & Kim's murrini look wonderful on the sides of this bright fat cat. Bead height is 21.44mm. Bead hole is 3/32", does not fit large holed chains. This is a sweet Siamese cat in sage and brown, absolutely adorable with pink toes. Height is 20.58mm. Bead hole is 3/32", does not fit large holed chains. Playing with the brown and turquoise combo this week (a lot!) turned out some lovely sheep. This one has a brown wool coat with a turquoise face, ears, tail, and feet. Inque was an ivory sheep, until she decided to tromp merrily through a bottle of India Ink that had NO reason to be in my studio... Now she's an ivory sheep with a black face, feet, ears and tail, trying so hard to look innocent. Height is 18.94mm. Bead hole is 3/32", does not fit large holed chains. I really like the color combination on this fellow - an ivory base with transparent grey stringer, matching the colors on the lizard's toes and eyes. Height is 28.3mm. Bead hole is 3/32", does not fit large holed chains. Height is 25.09mm. Bead hole is 3/32", does not fit large holed chains. The reverse of the other sheep with this color combo, he has a bright turquoise wool coat and a brown face, ears, tail, and feet. Height is 20.91mm. Bead hole is 3/32", does not fit large holed chains. Following the week's theme, this is a brown cat with bright flowers in turquoise on his sides. Of course, he has a perfect pink nose and adorable pink toes. Awwwww. Height is 19.28mm. Bead hole is 3/32", does not fit large holed chains. This is a curious kitty in ivory with scrolls and dots of transparent amber - so lovely! Height is 19.99mm. Bead hole is 3/32", does not fit large holed chains. I like this combination - an amber cone bead with silver deep within, and an organic green frog perched cheerfully on it. Be sure to click to see the base bead, it's quite lovely. Height is 22.02mm. Bead hole is 3/32", does not fit large holed chains. I found daisy hiding in the garden, out of sorts and blending far too well - the pirates sent her on a scavenger hunt, and well... She never should have trusted the pirates. Her shell is lemongrass green and her body brown, she's carrying a lovely daisy. Height is 17.6mm. Bead hole is 3/32", does not fit large holed chains. A two-sided, delightful fellow in black with yellow spots, eyes, feet, and antennae. Height is 34.33mm. Bead hole is 3/32", does not fit large holed chains. Mallory's silvered ivory shards look wonderful on an olive shaped base bead - perfect for a lizard with matching silvered ivory toes to cling to. Height is 26.82mm. Bead hole is 3/32", does not fit large holed chains. As discussed, a fun tuxedo kitty! This lovely, fluffy sheep has a white wool coat with an opal yellow cross on each side. Her face, ears, feet, and tail match the crosses. Height is 21.51mm. Bead hole is 3/32", does not fit large holed chains. This wonderful, bright coral lizard is wrapped around a pale green bead with periwinkle swirls and coral dots. His periwinkle toes match the bead! Height is 29.84mm. Bead hole is 3/32", does not fit large holed chains. I had this frit for a while and didn't try it... I think I'm in love! It's a blend of raku and Z-99, a wonderful mix that looks great on a black base. One bead is a fun tab shape, and the other is a basic round/donut. Tab focal height is 23.06mm. Bead hole is 3/32", does not fit large holed chains. I used John Rizzi's murrini on the sides of this fun white kitty. Of course, she has a perfect pink nose and pink toes. I like this fellow's fun shape, a dark blue pear! He's two-sided for extra fabulousness, with blue & white spats. Height is 30.91mm. Bead hole is 3/32", does not fit large holed chains. This chubby pink pig looks absolutely adorable with aqua flowers on each side of her body. The turtles are late to the party of recreational drugs, but finally caught up. (Pun fully intended.) This one is made with luscious organic silvered sage, bearing a peace sign on her shell. Height is 16.68mm. Bead hole is 3/32", does not fit large holed chains. Wonderful, beautiful silvered ivory made for an organic base bead, perfect for an ivory lizard with silvered ivory toes to curl himself around. Height is 30.67mm. Bead hole is 3/32", does not fit large holed chains. Silvered sage - how did I forget how wonderful you are? I used it for the face, ears, tail, and feet of this charming organic sheep with a glassy-eyed stare. Height is 20.3mm. Bead hole is 3/32", does not fit large holed chains. Height is 33.67mm. Bead hole is 3/32", does not fit large holed chains. A special cane for two-tone wool looks fab on this chipper white and orange sheep with green eyes. Height is 21.27mm. Bead hole is 3/32", does not fit large holed chains. This is positively silly - a stretchy-armed brown lizard wrapped around an olive shaped bead with coral and brown flowers on a brown base. Height is 29.51mm. Bead hole is 3/32", does not fit large holed chains. A white base with orange swirls made for a wonderfully curious fat cat with perfect pink toes. Height is 21.66mm. Bead hole is 3/32", does not fit large holed chains. Gaia is a wonderful silver glass - it leaves an "oilslick" shiny multicolor look that's fab. I used it on top of reactive Vanilla Ice for a inquisitive turtle. Height is 15.12mm. Bead hole is 3/32", does not fit large holed chains. A lovely, pure white cat with a pink nose and pink toes. Height is 20.48mm. Bead hole is 3/32", does not fit large holed chains. This is a charming pale grey seal with subtle ivory spots on his back, balancing a blue spotted ball on his nose. Height is 25.05mm. Bead hole is 3/32", does not fit large holed chains. Another cyclops was hiding behind the kiln with the stoned sheep, trying to fit in... I think they were making fun of him, poor fellow. He's white with an organic silvered ivory face, ears, feet, and tail. Height is 21.37mm. Bead hole is 3/32", does not fit large holed chains. Linen is a reverse of my classic white & ivory sheep - she has a fluffy ivory coat surrounding a white face. Height is 20.92mm. Bead hole is 3/32", does not fit large holed chains. When pigs fly? This charming pink pig has pale pink wings lined with just a bit of bright fuschia. Height is 21.46mm. Bead hole is 3/32", does not fit large holed chains. Love my shragons... silly little sheep-dragon hybrids just reaching for a hug! This one is a lovely ivory shade, with green eyes and matching green spots on his tail. Height is 26.91mm. Bead hole is 3/32", does not fit large holed chains. Lemongrass ends cap a wonderful ivory tapered bicone rich with pure silver. I trailed thin lines of Lemongrass over the center for added color. Height is 37.17mm. Bead hole is 3/32", does not fit large holed chains. I don't know why he amuses me so much - he looks dreadfully serious - but I still laugh whenever I look at this cyclops sheep wearing a fluffy white coat. Height is 21.62mm. Bead hole is 3/32", does not fit large holed chains. Height is 17.39mm. Bead hole is 3/32", does not fit large holed chains. This is a freehand shaped heart bead in pink. It's been cored with sterling silver and would look great on a simple chain, as shown here. Height is 27.66mm. Bead hole is just under 1/2". Pale Bullseye green in a wonderfully sparkly shade made for a fab two-sided alien with sparkly accents. Height is 31.27mm. Bead hole is 3/32", does not fit large holed chains. Extra silliness! Not only is he two-sided, screaming, and wearing the alien equivalent of Converses, but his spots, antennae, and eyes glow - click for detail to check it out! Height is 36.27mm. Bead hole is 3/32", does not fit large holed chains. Height is 19.93mm. Bead hole is 3/32", does not fit large holed chains. This is a charming fat kitty - she has a white body with spots of ivory, brown, and black. Of course, she has perfect pink toes. Height is 21.89mm. Bead hole is 3/32", does not fit large holed chains. A wonderful collection of leaf beads for Kate. Please don't purchase unless you're Kate. This is a proper tuxedo cat - he even has markings for a bow tie and spats! (I do adore spats...) Don't worry, I didn't forget about his darling pink toes. Height is 22.43mm. Bead hole is 3/32", does not fit large holed chains. I have no clue why, but I keep calling this darling pink pig decorated with shamrocks Paddy O' Furniture and laughing... He looks mortified, poor fellow. Height is 20.2mm. Bead hole is 3/32", does not fit large holed chains. Silver pink & rubino combine for a charmingly sweet kitty cat, complete with perfect pink toes. Height is 23.18mm. Bead hole is 3/32", does not fit large holed chains. The first sheep I made was very traditional - quite like this one in color, actually - a fluffy white coat with an ivory face, ears, tail, and feet. This one is darling with teal eyes. Height is 20.35mm. Bead hole is 3/32", does not fit large holed chains. I used a pair of John Rizzi's fabulous murrini on the sides of this charming silver pink pig - he's going cross-eyed trying to check himself out! Height is 20.72mm. Bead hole is 3/32", does not fit large holed chains. One of my favorite beads, this is a bright, cheerful green shragon just reaching out for a hug. He's a bit shorter than normal - maybe he's a teenager? Height is 27.78mm. Bead hole is 3/32", does not fit large holed chains. Height is 21.92mm. Bead hole is 3/32", does not fit large holed chains. I like this kitty, Sandstone with silvered ivory swirls and dots. Of course, she has adorable pink toes. Height is 24.14mm. Bead hole is 3/32", does not fit large holed chains. Height is 18.13mm. Bead hole is 3/32", does not fit large holed chains. Organic pork? Sure, why not! This one is a black pig with green & silvered ivory murrini on his sides, quite fun! Height is 22.92mm. Bead hole is 3/32", does not fit large holed chains. A chunky, fun heart, ideal for Valentine's - or any day. I used Mallory's silvered ivory shards, left slightly raised for a wonderfully tactile feel. Height is 30.84mm. Bead hole is 3/32", does not fit large holed chains. This is a chubby black cat with a silvered ivory moon on each side of her body. Of course, she has perfect pink toes and a matching nose. Height is 23.59mm. Bead hole is 3/32", does not fit large holed chains. This is a smaller version of a shragon, one of my favorite fanciful creatures. His arms are extended for a hug, and he has an Opus-like look of joy and delight. Height is 25.3mm. Bead hole is 3/32", does not fit large holed chains. Lemongrass was almost made for dinosaurs - a swampy, charming green that looks wonderful as a Loch Ness dinosaur with flippers instead of feet. Height is 36.53mm. Bead hole is 3/32", does not fit large holed chains. Translucent yellow with almost-matching yellow dots with air bubbles captured within made for a charming fat cat. Height is 23.33mm. Bead hole is 3/32", does not fit large holed chains. I like this delicate girly combination for a sheep - an ivory coat with pink face, ears, tail, and feet. Height is 24.74mm. Bead hole is 3/32", does not fit large holed chains. Height is 34.51mm. Bead hole is 3/32", does not fit large holed chains. This is an extra-fluffy model, a charming pink sheep with a white face, ears, tail, and feet. Height is 25.07mm. Bead hole is 3/32", does not fit large holed chains. Purple is a deep transparent color, so it's tough to tell, but this is a wonderful transparent cat, decorated with purple scrolls and dots. Height is 23.86mm. Bead hole is 3/32", does not fit large holed chains.